Imagine a world without measurement scales. Where you cannot know your height, weight, the temperature, how much you have or need to spend, etc. – because well, there are no scales to measure any of that. That would be a confusing world no doubt. Gladly, people have always found ways to graduate things into measurable quantities. Even as I type this on my computer, there’s a little column telling me how many words I’ve written. Not very necessary, but this just shows how important it is to measure things. However, many businesses are yet to create a measurement scale for one of the most vital factors to business success – competency. First, competency is the knowledge, skills, judgment, and personality traits that employees need to work effectively and to support business objectives. A ‘competency framework’ defines the required ‘competencies’ across all roles in the organization. Thus, this framework provides an easy way to measure if your people are acting competently and supporting the business goals, and what adjustments need to be made if they are not. To help you grasp this concept, below is a sample competency for Skill DB Pro. Here’s the definition for this competency as would be seen in our competency framework. This competency means that the features requested by current/potential customers are properly logged, and are considered when creating new features or updating old ones. Collect data from customer interaction and feature suggestion pages, use surveys, analyze feature trends in other providers. Reach a decision of most necessary features based on this analysis. Start working on features on a whim, decide what they think customers would need without actually doing due research, interact with customers but take no note of their thoughts on necessary features. Take note of customer feature requests during interaction, take note processes that are confusing or difficult for customers and that would be best simplified with a new feature, prioritize feature suggestion based on number of requests and sends to development. Do not log customer feature requests, work hard to create workarounds without suggesting a new feature to make things easier, send no suggestions to development. If we identify a couple of other competencies and define them this way, what we get is SkillsDBPro’s competency framework. As you can see above, a competency framework lays out the blueprint for ‘excellent’ performance within an organization. Generally, the competency framework of an organization consists of a number of competencies that can be applied to a broad number of roles within the organization. A good framework uses language that is clear enough for everyone to understand, explaining what an excellent job behavior really looks like, and what behavior would reveal a lack of competency. When a common understanding is established, it becomes the benchmark against which the overall performance of an individual, project, team, or an entire organization is assessed and evaluated. An organization that neglects to define its expected standard of performance, will become an organization where the judgment of good, bad or excellent will be highly subjective. When a company or an organization does not have a common understanding of good, bad and excellent, its judgment cannot be fair and cannot lead to development priorities. Ensure that people work effectively and produce results. Select and recruit employees that are a strong fit for the role and organization. Focus employees on improving their performance and skills. Identify gaps in staff and individual employee competencies, and on that basis provide valuable insights for creating highly targeted development initiatives. Provide a comprehensive roadmap for employee development, career planning, employee succession, and other important development aspects. 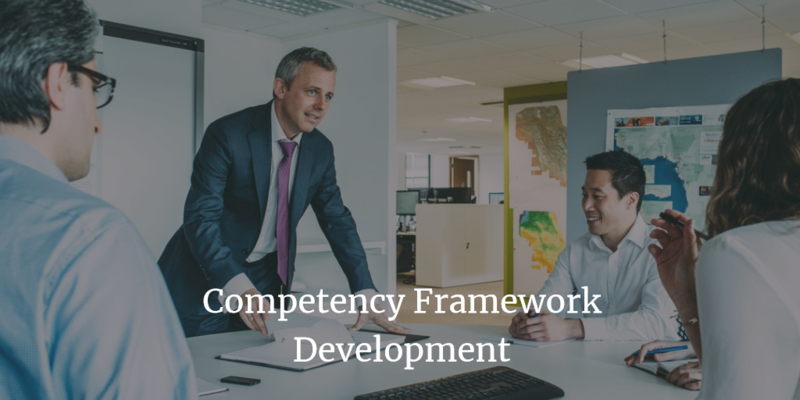 Clearly, a well-defined competency framework creates a unity of direction for employees on daily tasks and projects, development, and succession. The competency framework also becomes the guiding criterion for recruitment and selection. At the time of hiring new employees, a competency framework eliminates wastage of resources spent on recruiting, selecting and training the wrong people. A framework also ensures thorough assessment of an employee’s’ performance once it is implemented. These assessments give more consistent, credible and reliable results of what the employees in the organization are capable of doing. How To Develop A Competency Framework For Your Organization? Staff Consultation: When designing a framework, it would be a mistake for HR to do all the work. The reasonable and effective approach is to involve the people who actually work in various roles. Change Management: Getting people to use a framework involves change, and as we all know, change is often resisted. It is thus wise to create a careful approach to manage change. Effective Communication: All members of the organization should be fully aware of the framework being developed, the part they play, and their obligation when the framework is made available. By now you should already have a goal in mind for your framework. If not, that is the first thing you should establish. The purpose of your framework would determine exactly how you go about it. For example, if you were creating a framework strictly for recruiting new staff, it would be different from that needed for the entire organization, including top management – one obvious reason being that expectations for new staff and top management are often different. When you have your goal clearly mapped out, the following 4 steps would take you through the process of creating the framework. A team comprising of people from all parts of the organization should be involved in this project. This team helps ensure the frameworks involves every role and aspect in the business, and correctly represents the skills, goals and behaviors across the organization. The lead team also helps to manage change in each part of the organization. This is the most important step in creating the framework. The two best ways to gather information is by interviewing people in various roles, and using a questionnaire. If you want to have as much data as possible, it may be best to ask the opinion of all individuals about what is considered optimal behavior in a role or situation. In that case, you can create a questionnaire containing these questions and use it for an organization-wide survey. First, you want to study the data gotten from the previous step. Your framework would be built on the data gathered, and the first step to building from this data is structuring and grouping the information received into understandable clusters. The responses gotten should be analyzed and separated across distinct clusters. Q. What do you think makes a developer effective? A1. An effective developer carefully weighs the needs of customers before deciding which new features are most important. A2. An effective developer communicates his thoughts on necessary features with other members of the team and only spends time working on a feature when the team agrees on it. If you notice, the two answers above can be grouped under two different work attribute clusters. The first can be grouped under Judgment and Decision Making Cluster, while the second under People Cluster because this has to do with communication. This Civil Service Competency Framework for the UK clearly illustrates this clustering. When grouping items into clusters, you would likely notice that major clusters can have sub clusters. Take the example above, the second answer was grouped under People. However, this would be better categorized if it is grouped under People – Communicating. Thus, you can have other sub clusters like People – Collaborating, etc. under which other statements can be more appropriately grouped. This is also illustrated in the Civil Service framework above. After this step, you should have a clearly defined list of Clusters -> Sub clusters, and from here, your team can define the competencies in each cluster. Here’s an example of cluster and sub-cluster groupings. From this grouping, you can go on to create your statements of what is considered competent behavior for each sub cluster, grouped according to the job roles in the organization (see our sample competency framework at the start of the article). When writing competency statements, it is best to keep things really simple. Use language that is not ambiguous or hard to understand, so everyone can comprehend what competent behavior means in their job role. Also, you want to ensure the competencies are linked to business objectives. Since you already did a survey, this should be the case at this point, but you can make sure of this by have a few management level staff across departments review and make suggestions on the framework. Having a framework on paper is great – it gives the organization a clear sense of measurement. However, many things on paper are often neglected in our tech advanced world. Hence, many companies now opt to use a competency management system, in which you can define job role competencies based on your framework, and get immediate insight on how your people compare against the required competency for their role. A typical competency report lists the skills and attributes of an employee, people in a job role, department, etc, and compares this against their expected level of competency to help you visually identify gaps and training needs. If you already use Skills DB Pro, you can setup your competency management system by going to Admin > Skills Setup > Goals & Competencies. If do not yet use Skills DB Pro to manage your people’s skills, training, and competencies, please sign up for a 45-day full access trial of our system (no credit card required). After signing up, please contact us to let us know what feature you would like to see work for your company (possibly competency in this case). Our tech support team will guide and advise you through the entire setup process.